Need to heal your unsightly acne scars? For a quick and easy treatment, dab a little vitamin E gel onto affected area overnight daily until scars begin to fade. You can also use lemon juice, baking soda, aloe vera, and apple cider vinegar with honey. 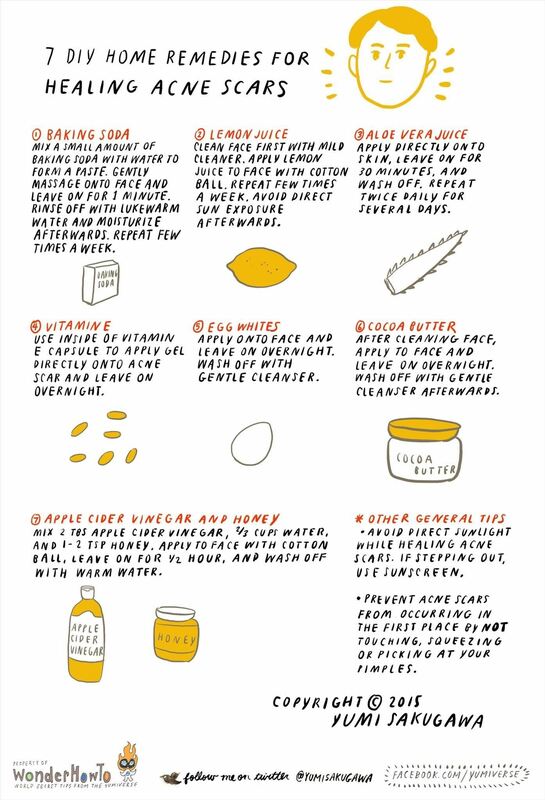 Read below for more DIY home remedies for getting rid of acne scars, and be sure to avoid direct exposure to sunlight while they are in the process of healing. Click on image to enlarge. I love dermalmd scar treatment serum and It's very easy to apply too much. It's very moisturizing and is helping to heal some old acne scars. I'm also using it on an old surgery scar. The first thing I noticed was it took out the redness and discoloration. Then the scars are fading at the edges in just a few days, I can't wait to see what the results will be like in a few months. I'm only using dermalmd on my face at night because it's so rich that it causes oiliness during the day, and I use it by itself.